Shoes: First half marathon on Vibram Fivefingers. Shook hands with Scott Dunlap in the parking lot and wished him luck. Got pic with Endorphin Dude. 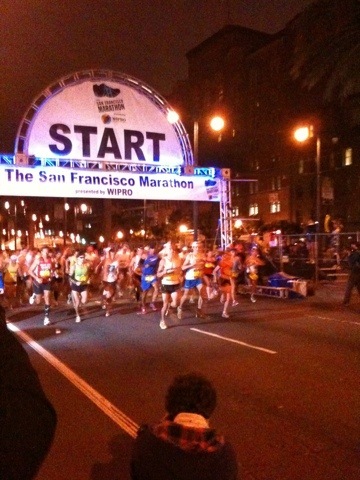 Saw Deana Kastor zoom passed me on her way to finish. Mike Wardian front and center. 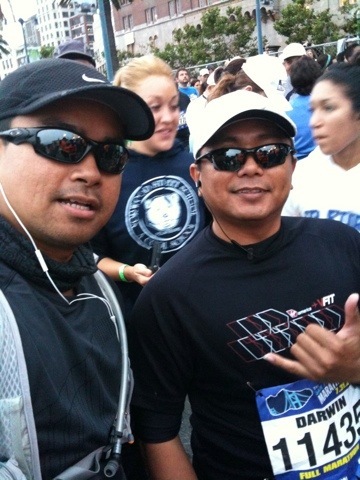 Chilling with Darwin having fun making fun of how nervous we were on our first half marathon. Passed-up by Darwin. I believe he had a nature call, because he shot up ahead earlier. Hills 10-11 was where I felt the strongest. Experienced blister hotspots on my left foot, but didn’t want to deal with it. 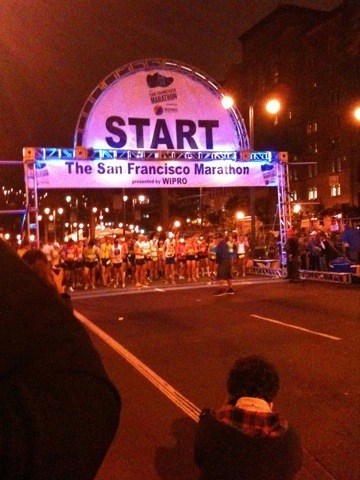 In the end, I had no blisters, which leads me to believe I corrected electrolyte and fluid levels. My feet just started to hurt in other ways. Another issue was with inner thigh chafing. Bodyglide didn’t last. 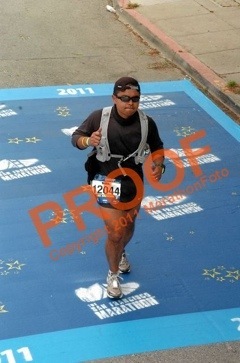 Looking back I should have grabbed some vaseline from the med stations for quick relief. Legs tightened up and feet sore by 13. So much for corrected electrolyte and fluid levels. LOL. Midway the race I put away the ear buds. I got too tired fiddling with iPod to play the next music podcast or set the playlist to continuous play. Beer shot from some devil between mile 15-16. All thanks to the Hash House Harriers. Some of which dressed in devil costumes. Threw-up half and for a short while felt great. Met up with Naid and Ate at 18. Looking at some video I must have been pretty dehydrated of something because I swear my speech was blurred. More than usual. 😀 I gave both a hug and Naida a kiss, blabbered something incoherent, waved, and waddled off. 18.25 was handed bottled water (watermelon) a blessing. 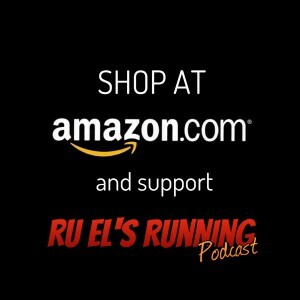 Mile 23, met a woman who said she didn’t listen to her doctor who told her not to run. I told her it’s ok and that she would finish. Women are stronger and defying her doctor takes guts. I’m certain she got to the finish. 23.5 felt a jolt of energy as band or dj played on. Pumped my fists to the rhythm. I also sucked all that was left from my hyrapak along with the last GU packet I could stand to take in. 24.5 the David Bowie tribute band played on. Appreciated them being out there, but was more disturbed by the dude in tights and was more motivated to get away from them even though I was already pretty beat. By this time sun was pushed some heat down on this part of the course and it sucked and I was out of drink. Mile 25 saw a pickup full of supplies which looked like they were about to head out. I’m pretty sure they weren’t an official aid station. I stopped along side of them and asked if I could have a bottle of water. She gladly said yes and also offered food. I thankfully accepted the cold bottle of water and declined any food. I said “God Bless you guys!” and she returned the salutation. I doubt she knew how huge her aid was and I’m tremendously grateful. Since I doubt I’d meet her crew again, I wish her and friends the best. I’ll have to volunteer at an aid station on of these days and return the kindness. I sipped some of the cold water and poured more down my back though my band around my neck. I soaked it as a way to keep me cool and refreshed as possible. 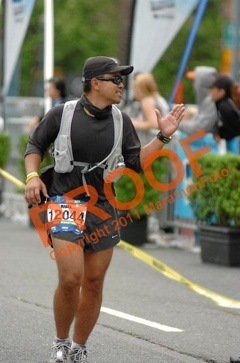 Approached the finish chute, blew a kiss to Naida, and crossed the finish line with all that was left in my legs and feet.